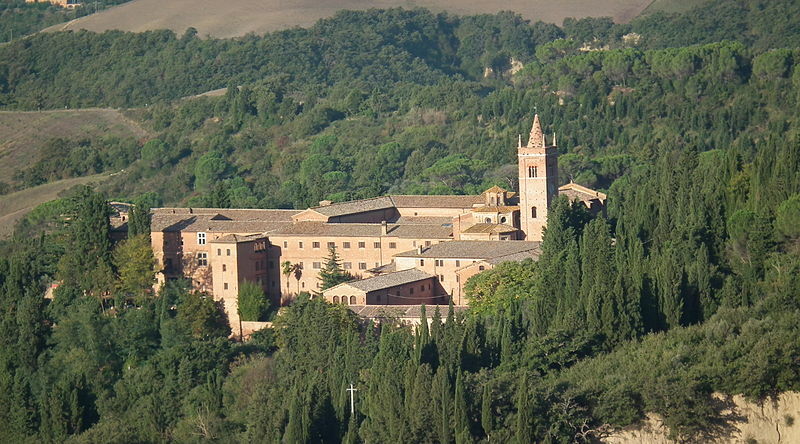 Monte Oliveto Maggiore-Benedictine Abbey founded in 1313 still steeped in ancient tradition. Deep within shadows of the ancient Monastery, monks in trailing white robes bend intensely over vases of herbs. Masters of herbal potions, they are concocting a curative elixir. Outside, towering Cypresses, chapels and footpaths surround the fortress-like monastery. Gregorian chants can be heard, echoing throughout the valley. An Amaro liqueur carefully crafted by these monks has been secretly blended. 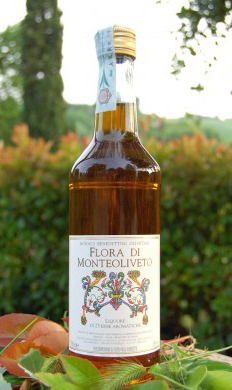 Today, the Flore di Monteoliveto liqueur is not such a secret. Infused with 23 medicinal and aromatic herbs and aged for over six months, it makes an impressive after dinner digestive. At 38 proof, a little dab will do you. The shop inside the Tuscan Abbey keeps a good supply for sale. Ancient elixirs were a blending of herbs and plants steeped in alcohol that provided health benefits and restorative powers. 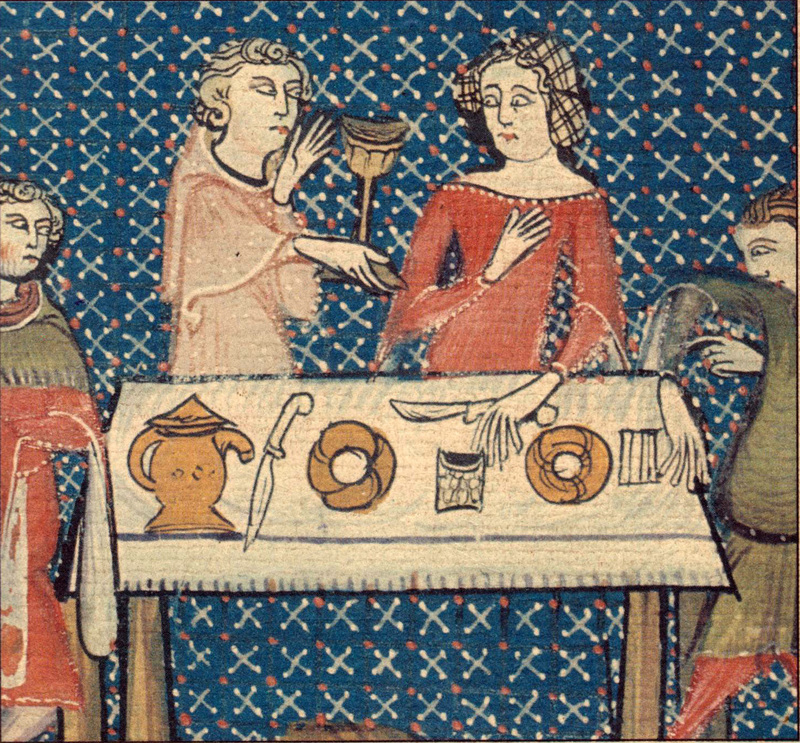 Monks, the Middle Age alchemists, created the recipes for these secret herbal brews. Amaro is typically made by soaking herbs, roots, bark and/or citrus peels in alcohol, either wine or neutral spirits, mixed with sugar syrup and then aged in casks or bottles. Yum! But these Monks of mystery do more than brew herbal potions. Beehives stacked like crooked chimneys in the monastery yard are attended by monks wearing veiled hats, cultivating honey since medieval times. A garden stands alone, planted with many of the herbs used in their medicinal recipes, the harvesting shared among them. Groves of olive trees provide a fragrant oil. Inside the library, several monks labor over the restoration of a stack of old books. Industrious, they continue to work in quiet solitude. As they remain isolated from the outside world, their live’s remain relatively unchanged since earliest times. To enter Monte Oliveto Maggiore, a medieval drawbridge stands at the entrance of the Abbey below a tall square tower. As you pass over the drawbridge, the atmosphere changes from one of defense to celestial peace. A 15th-century cloister, drenched in filtered light with pots of blood-red geraniums surrounds you. A white-robed monk reaches out and gently draws you inside. Hi there.. does anyone know of a list of Italian monasteries and convents who make liqueurs and spirits or of a book that I can buy on the subject. As far as a list, no I don’t. You might try Amazon to see if they have any books containing a list. What I have done is find them in a particular region I will be in and check google to see if they make their own liqueurs, etc. I learned about Amaro 27 years ago when I spent a week at Giuliano Bugialli’s cooking school in Florence as a 50th birthday present to myself. I didn’t learn about it in class but when I ran into two fellow “students” at, I think, the Borsa Bar. Anyway I loved it then and still do. The bar is still there; I was in Florence in December. I have a bottle of Amaro in my pantry and this has reminded me that tonight would just be a good time for a sip. Joan, thank you for your comment. I couldn’t agree with you more. I hope you do take a sip of that memorable Amaro. It will take you right back to where you left it…..! !